The owner of the classic 34.75 metre sailing yacht Merrymaid, listed for sale by Mike Horsley at Edmiston & Company, will now agree to a long lease charter for €250,000 per year, deductible from an eventual purchase price. 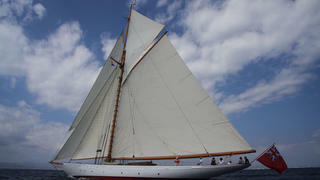 Built in teak on oak frames by British yard Camper & Nicholsons to a design by Charles E Nicholson, she was delivered in 1904 as a gaff cutter. In spring of 2008, she completed an extensive refit that brought her back to her previous splendour and she then set sail for a worldwide circumnavigation. Accommodation is for six guests in three cabins consisting of a large master suite aft and twins to port and starboard, all with en-suite shower facilities. There is also accommodation for six crew in three cabins aboard this yacht for sale. A charming and very cosy saloon has two sofas, a dining table on a rise-and-fall mechanism, and there is skylight allowing the daylight to pour in, while further features include a gas-fired fireplace and an entertainment centre including a large Samsung television and a DVD system. Forward of the helm station is a cockpit with a foldable table and seating for up to six guests, while the wheel has a quite unique instrument that shows the angle of steering. Under power, a Perkins Sabre diesel engine delivers a maximum speed of 10 knots. Most of the boat is still original and there are spare parts for everything, which is a major plus for a boat of this age. Lying in Palma de Mallorca, Spain, Merrymaid is asking €4,950,000 with VAT paid.